Bouquet Taupe ← You Want Me To Wear What? 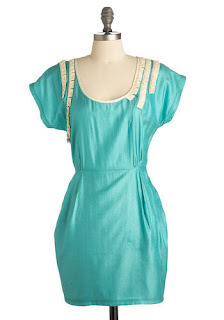 Maybe it’s just me, but in many cases, the names given to ModCloth dresses don’t seem to match what they actually look like. For example, this is called the “In The Limelight Dress.” When I saw it linked on Twitter, I expected it to be either a) green, b) sparkly, or c) worthy of a red carpet. Personally, I think it looks like it’s from the 80s, and not in the good retro way. This, on the other hand, is one of those cases where the name perfectly suits the dress. Because this is a bridesmaid’s dress. I mean, yes, it’s a little drab, but it’s a perfectly nice dress, and the point stands. 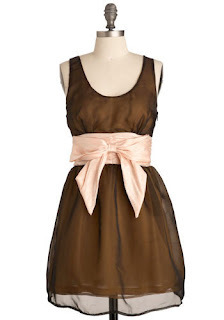 This is a bridesmaid’s dress, plain and simple. Although, I have to say, this part of the description is just absurd: “When the time comes for the highly anticipated bouquet toss, you hang back for a few, admiring the joyful aura of your newly wed pal from afar. She looks back, catches your eye, and smiles widely while silently mouthing, “I love your dress!”"
One of my best friends got married almost a year ago (early happy anniversary, Ava and Joe!). If she, at any point during the wedding, had taken notice of my dress, I would have smacked her upside the head and told her to get her head back in the game and focus.